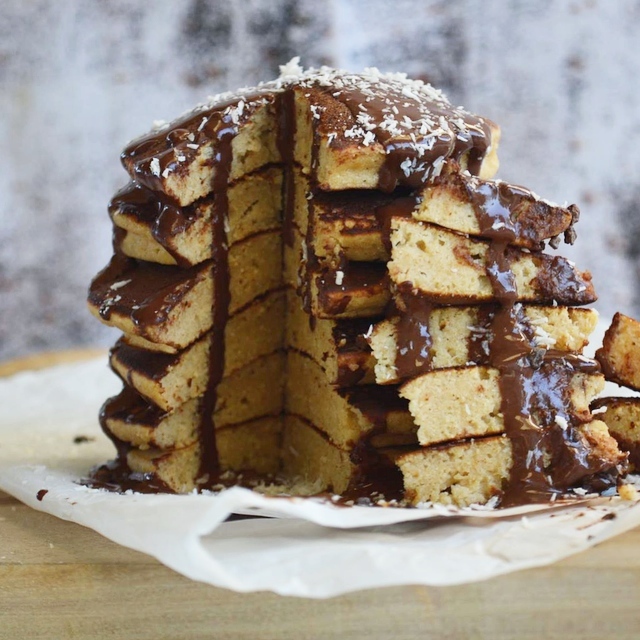 Chocolate meets coconut… Lamington meets pancake… you are all going to go in sane over these! Make a well then add in all other ingredients, except the eggwhites. Mix well. In a separate small bowl, beat eggwhites until stiff peaks form. Fold the eggwhites through the pancake mixture. Heat a pan greased with coconut oil to medium heat. Place spoonfuls of desired size into the pan. Cook for 1-2 minutes each side (or until bubbles form) then flip. Meanwhile, combine the cacao, coconut nectar and hot water and stir until smooth. Add in the tahini or nut butter and mix well, add more hot water if required. Serve the pancakes with the sauce, coconut and coyo. 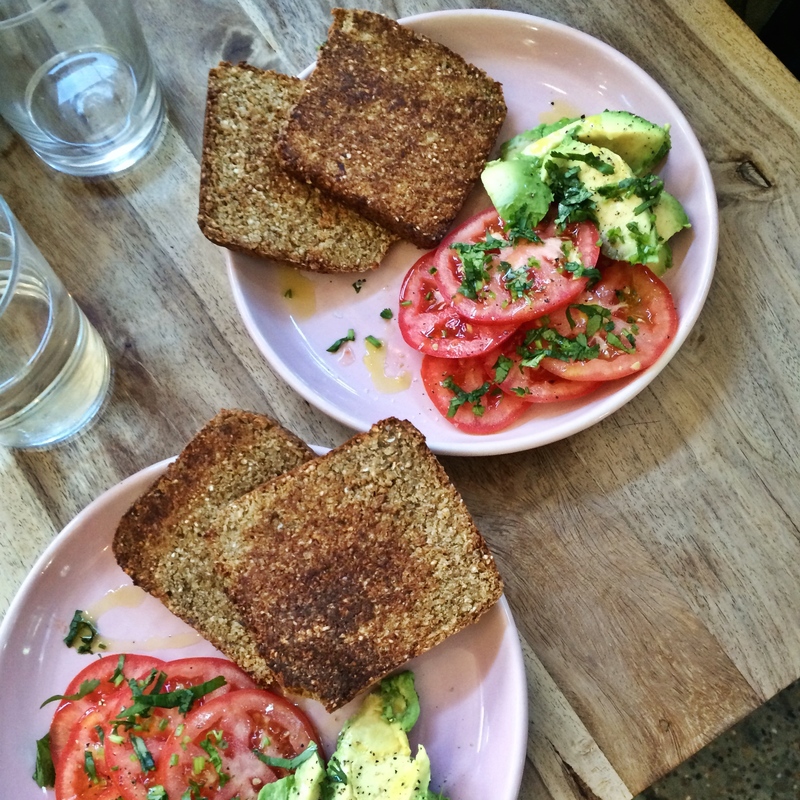 To all my Sydney foodies out there, I have made a list of my favourite cafes- all full of healthy options! 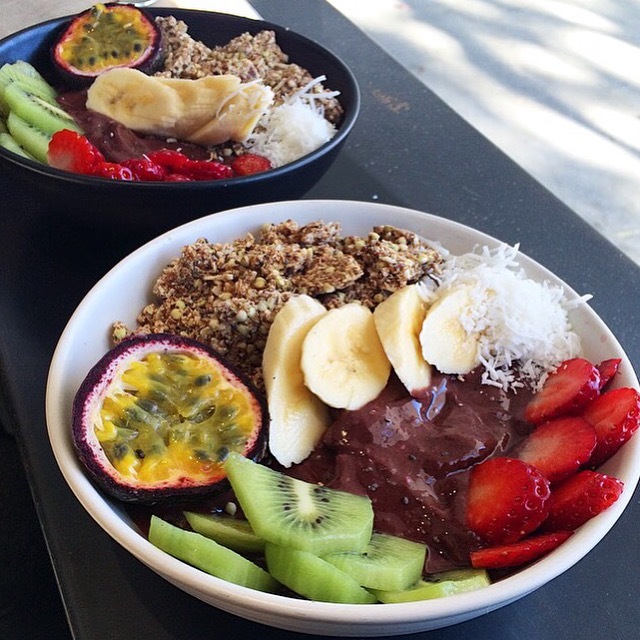 Ritual in Northbridge– hands down my favourite acai in Sydney which is a big call! Topped with ‘rawnola.’ Also has a slight cacao-y flavour which I love! 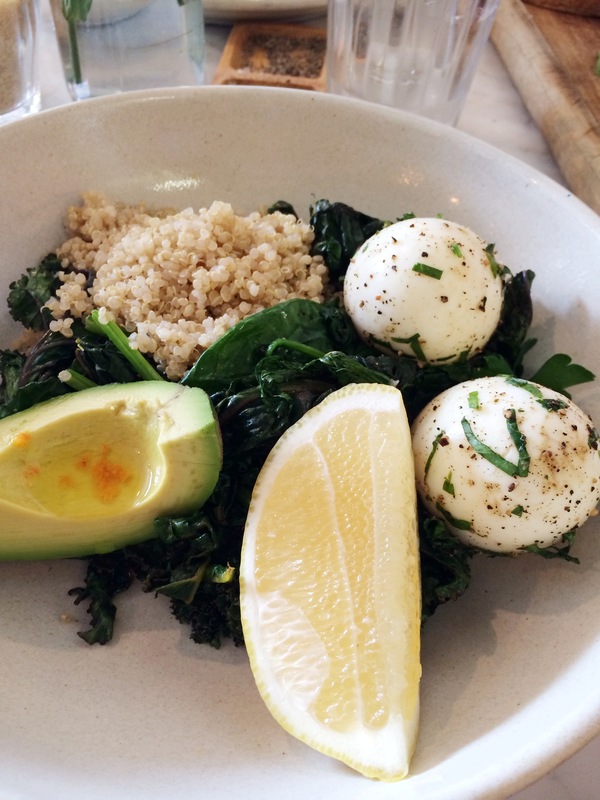 Porch and Parlour– LOVE their green breaky bowl: ‘porched eggs’, quinoa, sautéed greens, avocado… incred. Lox Stock and Barrel– their brussel sprouts are IN SANE. Take my word for it! 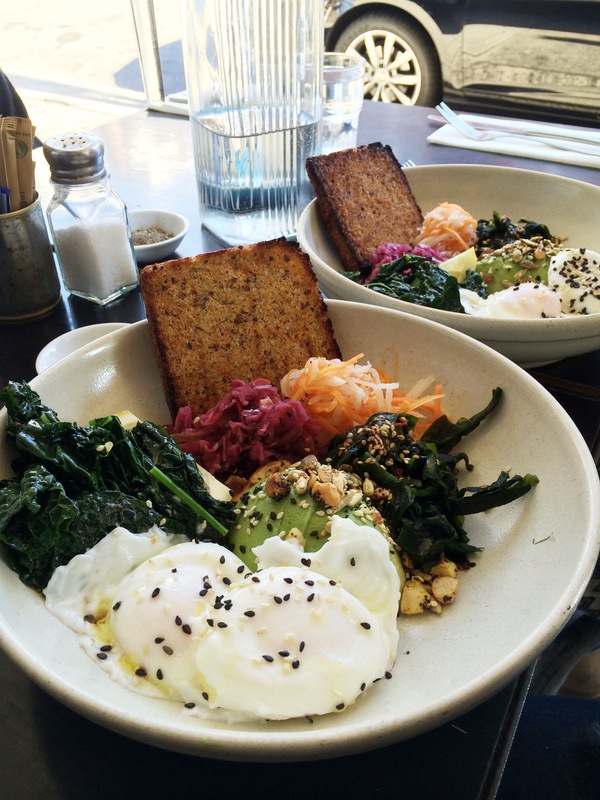 Love their pumpkin quinoa salad with miso dressing and the ‘Bowlarama’ (poached eggs, hommus, avocado, quinoa toast, fermented veggies, nuts and seeds). Egg of the Universe in Rozelle- potentially my FAVE smashed avocado with a drizzle of incredible pesto (both their spelt sourdough and gluten free toast are delish). Enough said. Cute yoga studio attached too- great $43 student trial which includes unlimited classes for a month. 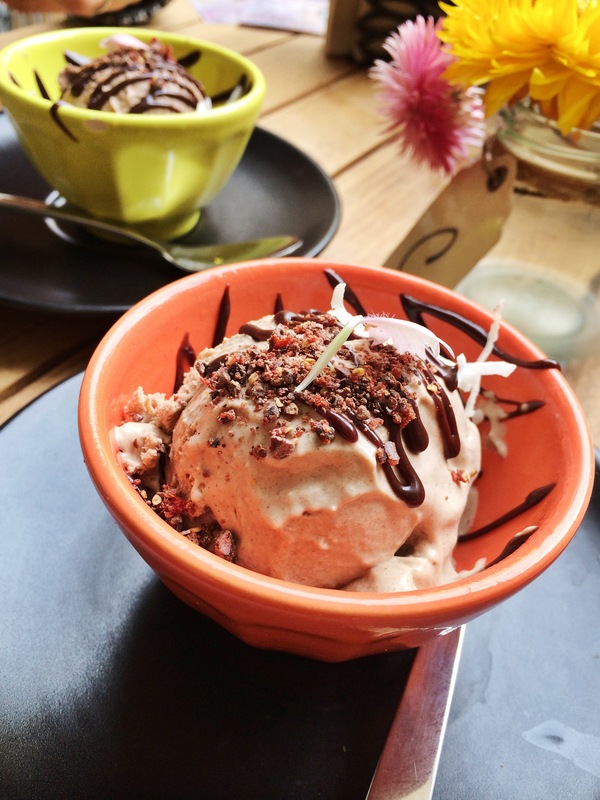 Earth to Table in Bondi- a scoop of their cinnamon icecream is the PERFECT afternoon snack. Completely dairy, sugar and gluten free. YUM. 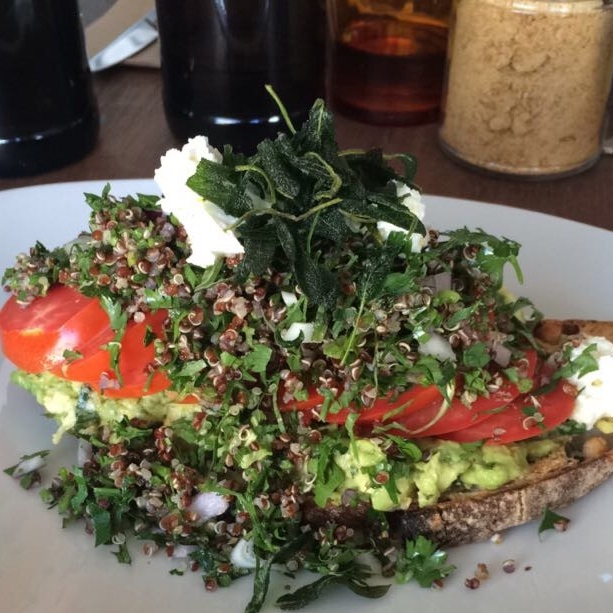 Dachshund in Hunter’s Hill- their smashed avocado on sourdough topped with quinoa tabouli is BEAUTIFUL. Such a filling and healthy option. 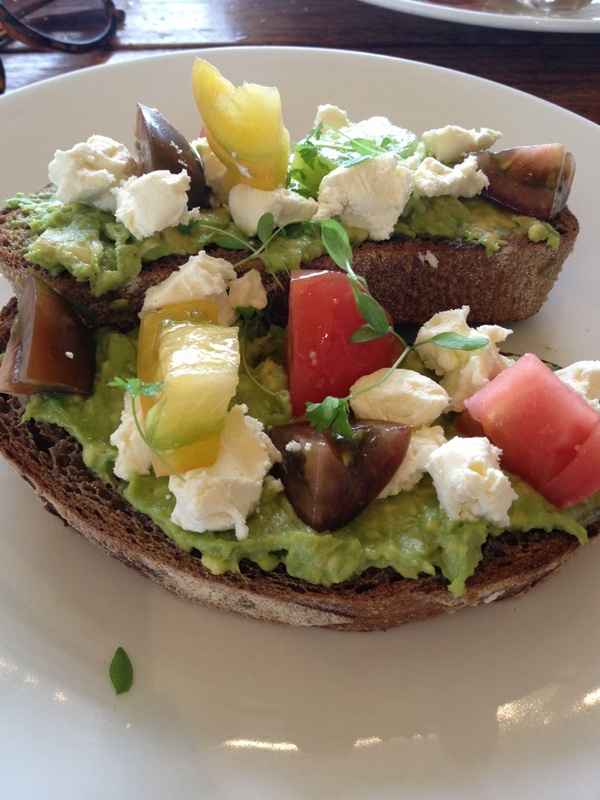 Bread and Circus in Alexandria- love their fruit platter if you’re looking for something fresh and their avocado and tomato on sprouted essene bread. 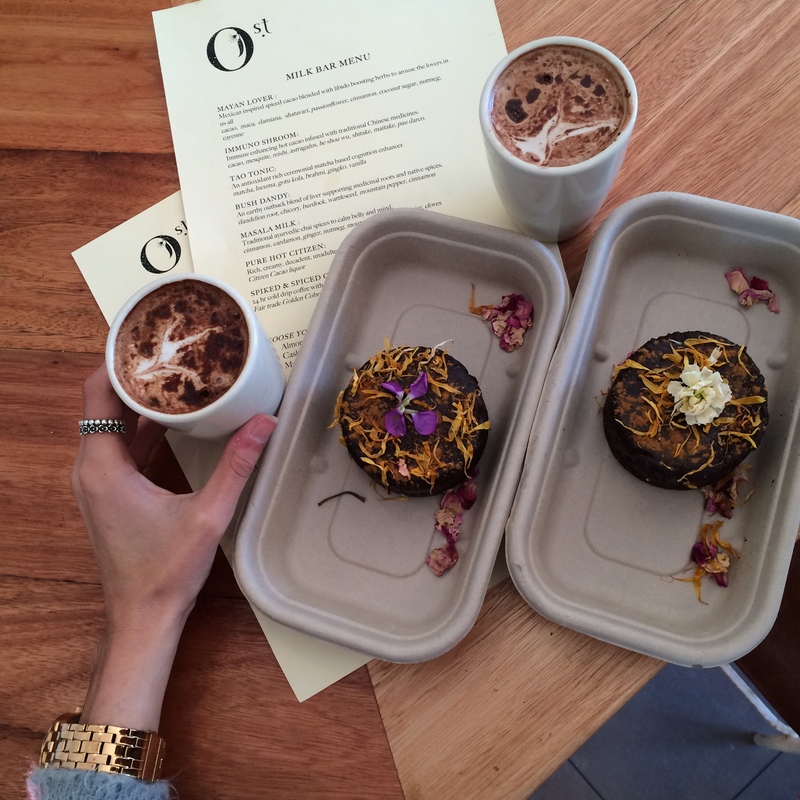 Orchard St in Bondi- delicious hot chocolate made with nut mylk. 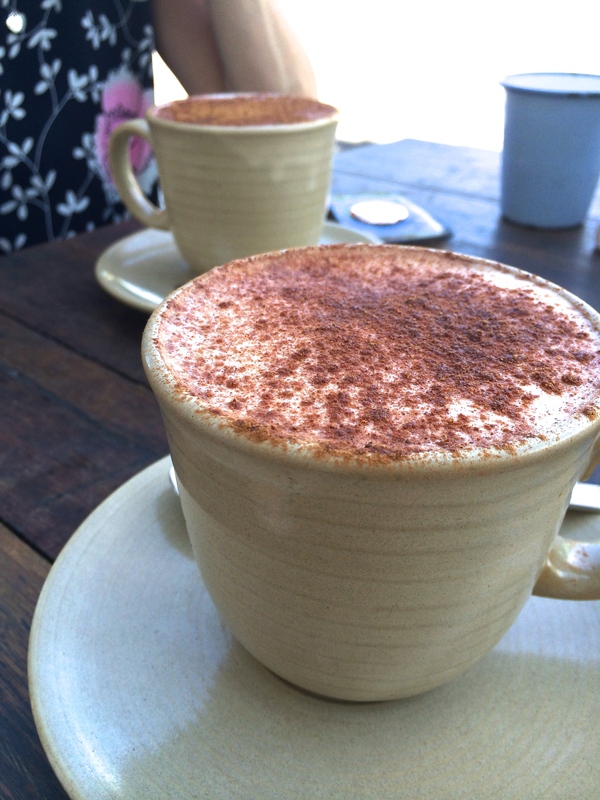 I LOVE their Mayan hot choc- hint of chilli! Also an out of this world raw choc-chilli cake. The combo works so well. Bills in Surry Hills- have only been here for dinner but I had an incredible spelt pasta with kale and pistachio pesto and edamame! So nourishing and delish. 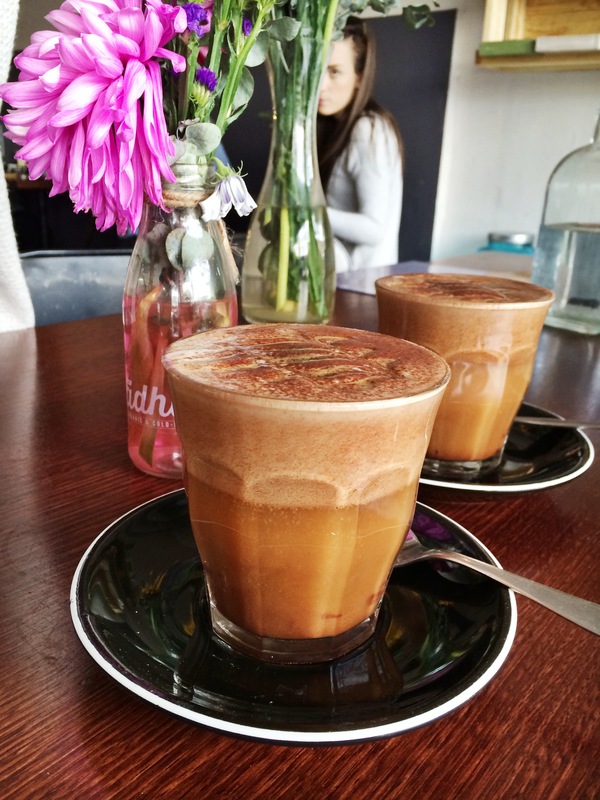 Sadhana Kitchen in Newtown- their acai bowl is pretty up their and their salted caramel hot chocolate with coconut milk is probably my fave healthy hot choc of all time! 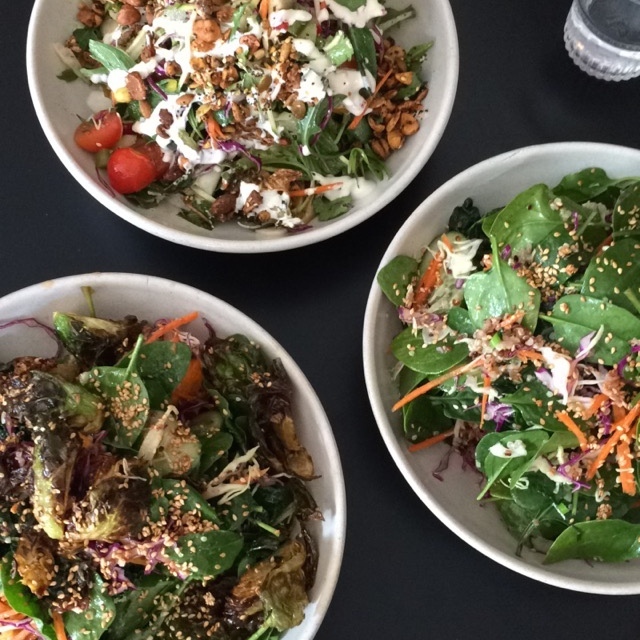 Cooh Cafe in Curl Curl- delicious salads and a really yummy hot cacao with almond mylk! 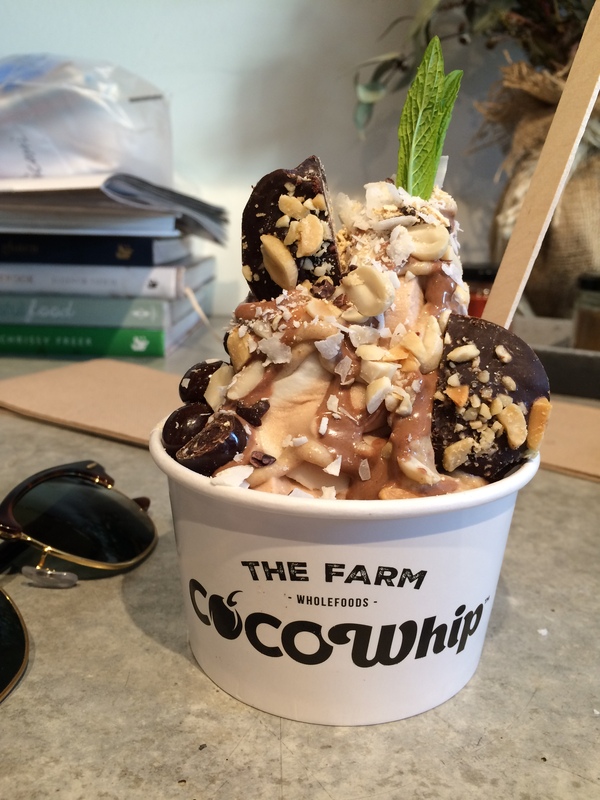 The Farm Wholefoods in Potts Point- if you’re feeling like something a bit indulgent, try their peanut praline coco whip, topped with a raw peanut butter cup. Yum! 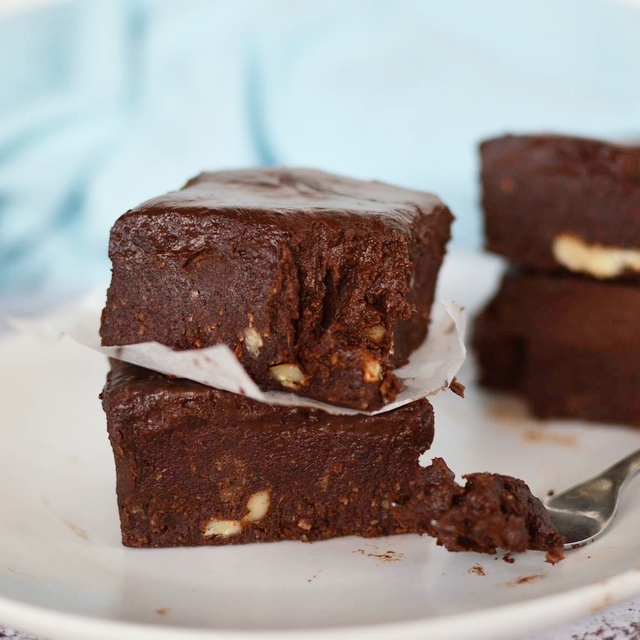 These super fudgey brownies are no-bake which make them so quick and easy to put together. Absolutely perfect for all you chocolate lovers out there! Place all brownie ingredients into a high speed blender. Blend until well combined. Press into a small rectangular tin lined with baking paper. For the ganache, place the coconut milk in a small saucepan and over medium- high heat until it reaches boiling point. Place the chopped chocolate in a small bowl. Pour over the boiling milk and leave for a few minutes without stirring. Once the chocolate looks fairly melted, stir until smooth. Pour over the brownie and place back in the freezer to set for at least 20 minutes or until firm then transfer to the fridge. 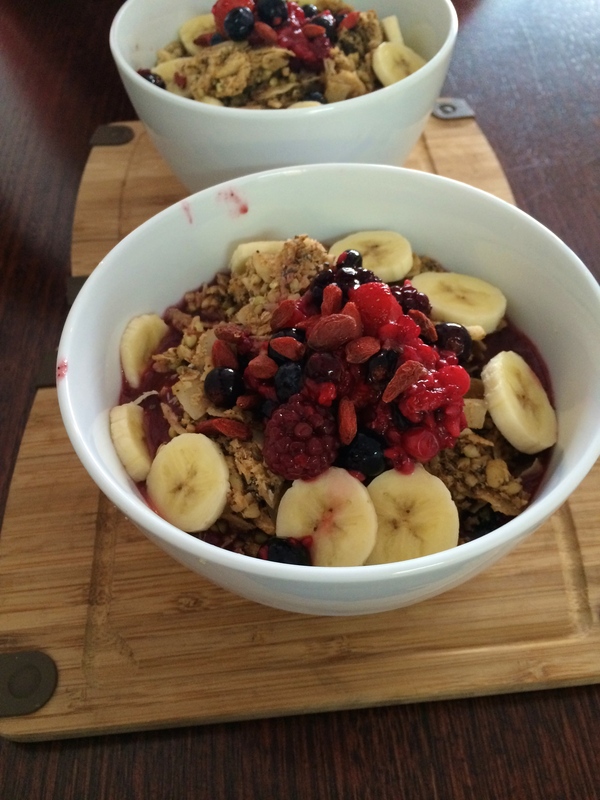 Isabelle shares her top healthy snacks! 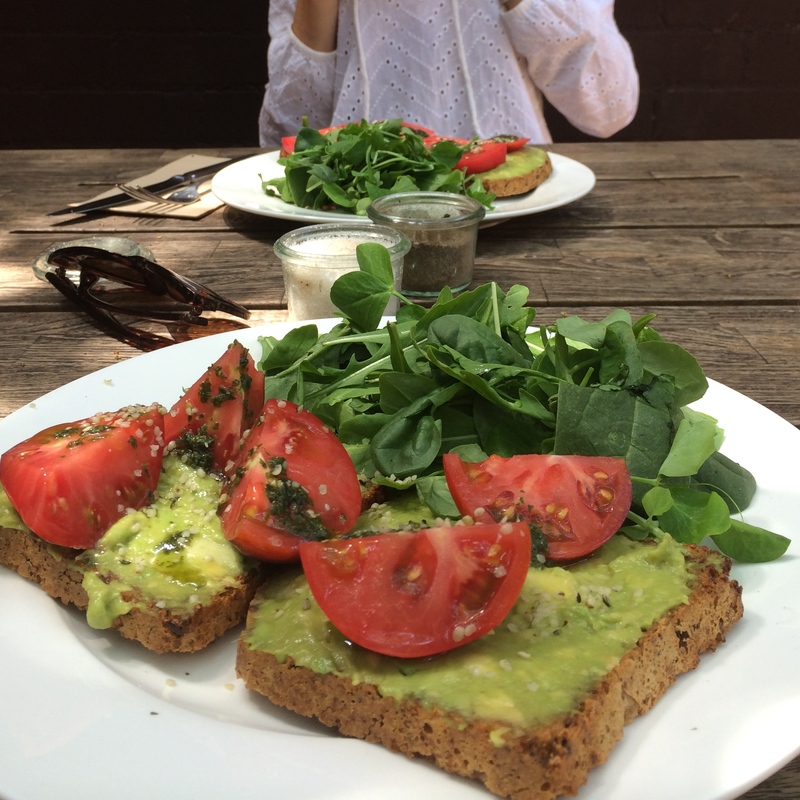 My gorgeous sister Isabelle (@isabellefisherr) shares with us her favourite healthy afternoon snacks that will keep your blood sugar levels stable and your metabolism going! I love making a quick carrot mug cake when I’m short for time. In a mug add: 2 tbsp almond meal, ½ grated carrot, 1 tsp tahini, 1 egg, 1 tsp raw honey, dash almond milk, sprinkle of cinnamon, nutmeg and ginger. Microwave for 40-50 seconds. Top with a dollop of Greek yoghurt and crushed walnuts. 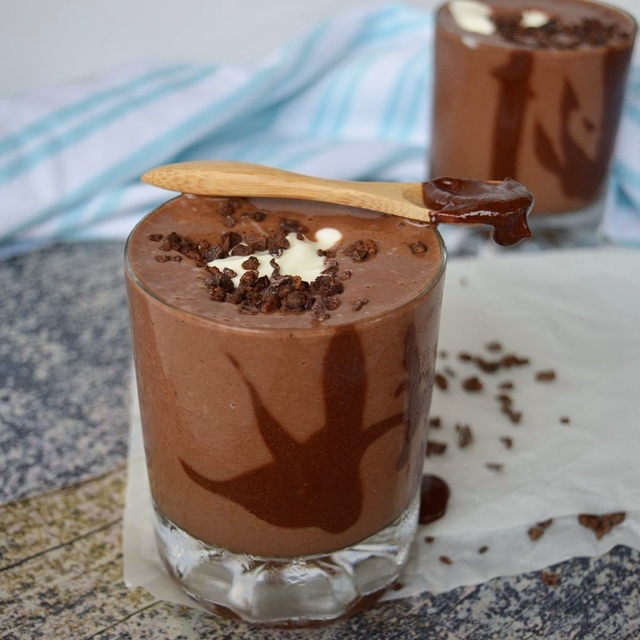 Chocolate milkshake– 1 cup cashew, almond or coconut milk, 1 tbsp cacao, 1 tbsp almond butter or macadamia butter, 2 medjool dates, 1 tsp cinnamon, 1 tsp mesquite- blend together in a high-speed blender (I use a Vitamix). I love making a tropical smoothie. In a blender throw 1 cup frozen mango, ½ cup frozen berries, ½ cup coconut or almond milk, ½ cup cold water, 1 tbsp coconut protein and a small handful of cashews and blend until smooth and creamy! I love putting mine in a bowl and eat with a spoon. I am obsessed with medjool dates at the moment! 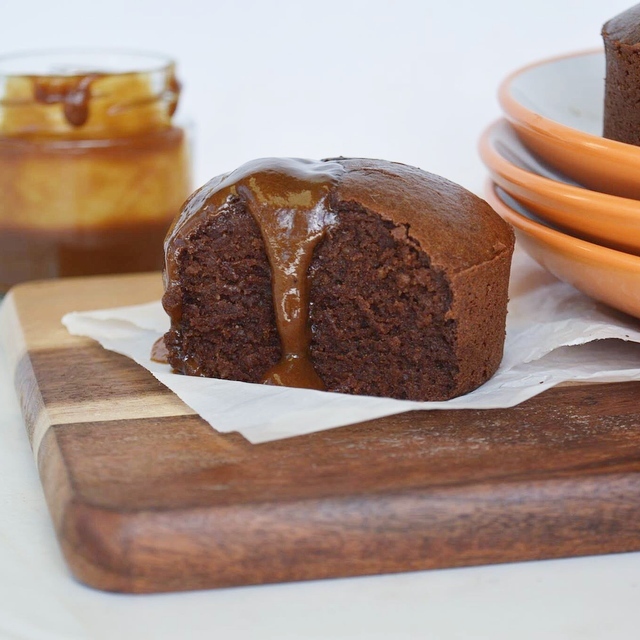 I have about 3 filled with a teaspoon of almond butter… it tastes like caramel! I have this alongside a chai tea and some fresh fruit. Greek yoghurt is another go-to snack for me- I love it with chopped strawberries, blueberries, kiwi fruit, crushed almonds and macadamias, a teaspoon of raw honey and cinnamon! Mung bean crackers with smashed avo: ½ an avocado smashed with lemon juice, olive oil, Himalayan salt and cracked pepper. One of Sophie’s famous fudge brownies with hot caramel sauce! One of my favourite treats- so decadent! A grilled banana cut lengthways, topped with 1 tsp honey, 1 tsp tahini and a sprinkle of cinnamon mixed together. A handful of tamari almonds (available from health food shops) and an apple. 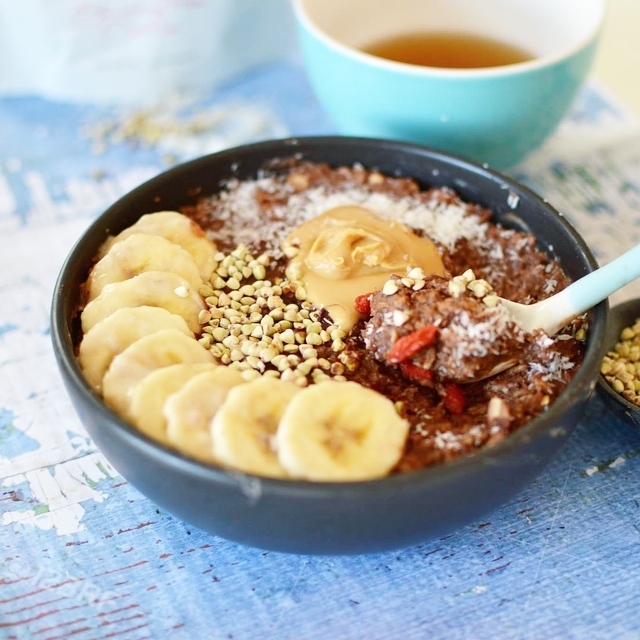 Boring porridge just had a makeover… and it is delicious and more nutrient-packed than ever! A great winter warmer. Add all porridge ingredients in a small- medium saucepan and bring to boiling point. Simmer for around 5 minutes, stirring or until the porridge has reached a desired consistency. Decorate with toppings and serve. Boy, do I have a winter warmer for you! This soup accentuates the sweetness, rich flavour of pumpkin. Roasting it achieves a wonderful, caramelised flavour, while the cashew milk provides an incredibly creamy texture. My beautiful friend Hannah (@healthsynergy) gave me this lovely idea of adding cashews- an absolutely phenomenal addition! 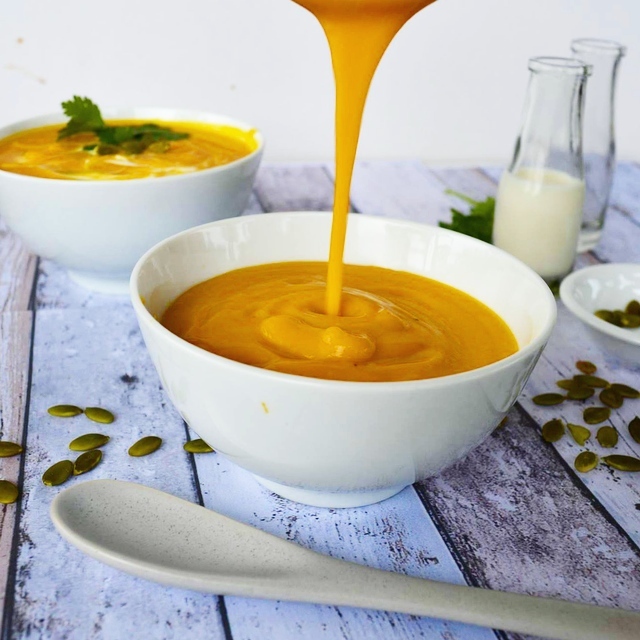 There is nothing quite like a silky pumpkin soup- this one is certainly no exception! An absolute winter MUST. 2. Chop the pumpkin, place on a baking tray and brush with olive oil. 4. In a Vitamix or good quality blender, place the cashews and water. Blend until well combined. Make sure the cashews are completely blended to form a ‘milk.’ If the volume is not great enough for the blender, add a small amount of pumpkin and allow all contents to reach a smooth consistency. 5. Gradually add all the pumpkin a blend until really well combined. 6. Pour the contents into a large saucepan over medium- high heat. 7. Pour in the vegetable stock (add more or less depending on desired thickness) and stir. Also add in the mustard, coconut sugar, salt and pepper. 8. Allow to simmer for about 10 minutes. 9. Serve with coriander and toasted pumpkin seeds. Makes about 4 small bowls or 3 larger bowls. I love serving mine with toasted lebanese bread! Easter may have come and gone, but that doesn’t mean it’s too late for a chocolate fix! This one is the perfect warmer for the cooler weather. If you love creamy and thick, then this is for you! Bring the coconut milk, vanilla and cinnamon to a simmer in a small to medium sized saucepan, over medium heat. Meanwhile, in a small bowl, place the coconut sugar, cacao, tapioca flour and mesquite (if using) and the salt. Pour a small amount of milk into the small bowl with the cacao mixture and stir until smooth. Transfer this smooth chocolate mixture into the saucepan with the rest of the milk. Stir well and add in the chocolate. Bring the mixture to the boil and allow to bubble for about 3-5 minutes or until it reduces to your desired thickness, stirring occasionally. I love mine with a dollop of coyo! 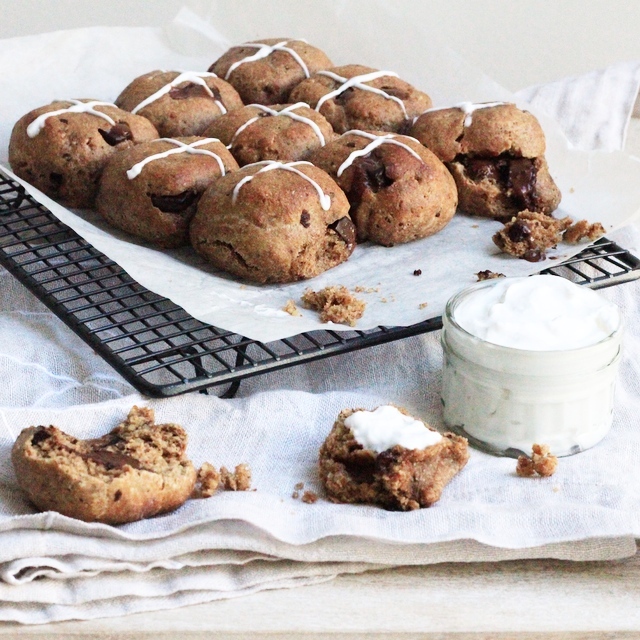 Nothing says Easter more than a sticky hot cross bun oozing with melted chocolate. Hannah (@healthsynergy) and I created a healthy version of the traditionally sugar-laden treat, using coconut sugar (a low GI alternative), cashew mylk and spelt flour. I can vouch that these buns are absolutely impeccable- you will NEVER feel the need to buy them shop-bought ever again! 1. Combine yeast, coconut sugar and warmed cashew milk in a large mixing bowl. 2. Cover and set aside for 5 minutes. 3. Add flour, spices, vanilla, coconut oil, egg, roughly chopped chocolate and mix well using a wooden spoon. 5. Lightly grease a mixing bowl with 1 tsp coconut oil and place the dough in the bowl. 7. Preheat oven to 180 degrees celsius, fan-forced. 8. Divide into 10 equal portions and roll into balls. 9. Arrange on a tray lined with baking paper and sit for about 10 minutes. 10. Place in the oven and bake for approx. 10-12 minutes or until slightly golden and risen. 11. Remove from oven and set aside for a few minutes. 12. Place the coyo or cashew cream in a piping bag and draw crosses on the buns. 13. Serve and enjoy! We love ours with plain and chocolate coyo. Ditching sugary junk food has never been so easy! This wholesome, delicious alternative will be sure to tantalise your tastebuds while delivering many nutrients! Add all thickshake ingredients to a high-speed blender. Blend until creamy. Add all the sauce ingredients to a bowl. Drizzle some of the sauce around the inside of 2 small glasses. Pour the thickshakes into the glasses. Top with cacao nibs, coyo and the remaining sauce.